Audi has unveiled its AI:ME concept vehicle, an electric, fully autonomous car, which is designed to be a "third living space" and includes real plants. 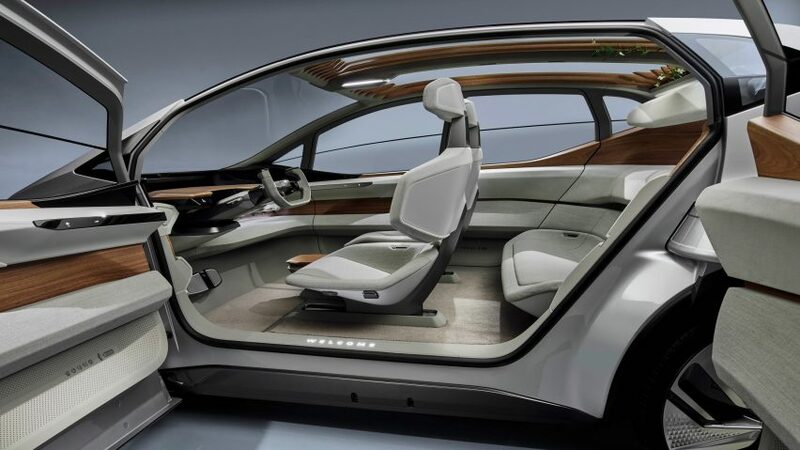 Revealed at Auto Shanghai 2019, the concept car is fully autonomous, but also has a steering wheel to allow the user to drive when needed. Audi described the compact vehicle as the "autonomous city car of the future". The German car maker developed the Audi AI:ME to be a small electric car that has an interior users would be happy to spend time in. "The car is increasingly becoming a 'third living space' alongside our homes and workplaces," said Audi. "It is thus only consistent that the Audi designers did not subordinate the interior of the Audi AI:ME to the shape of the body. On the contrary, they prioritised the interior and made it the core of the whole vehicle." A compact car, which is 4.3 meters by 1.9 meters, the Audi AI:ME has a large interior area for its size. Replacing the traditional engine with an electric motor allowed the company to reorganise the car and create a larger wheelbase – the distance between the front and rear axels – of 2.77 meters and a height of 1.52 meters. Audi envisions the inside of the car being a calm atmosphere within the city – a "high-tech refuge during rush hour". Its temperature, ambient lighting and seat positioning are all adjusted to the user when they get in, while a noise compensation system completely suppresses the sounds of the city. "We create a feel-good atmosphere by appealing to all of the users' senses," said Audi designer James Nissen. Living plants will also be incorporated into the Audi AI:ME's roof, described by the company as the first use of vegetation in a car's interior. "We use climbing plants across the see-through roof to bring a bit of nature into the big city. Aside from that, they improve the air quality," continued Nissen. The car is designed so that it can be autonomous in areas where this is allowed, and driven where required – this is known as level-four autonomy. In areas where the driver is not required the car is reconfigured, with the steering wheel becoming a table. "When the passenger switches to self-driving mode, the steering wheel folds down and a table folds out," said Nissen. The car also incorporates VR goggles for entertainment and magnetic cupholders and plate holders so that users can easily eat and drink. Externally the car's two main design features are side doors that open in opposite directions to allow easy access, and innovative headlights that will be used to communicate to other road users. The LED lights are positioned high on the car to allow them to be easily seen by pedestrians or cyclists. "In the future, the lights should replace eye contact with the driver and let the car inform its surroundings about what it is doing," said Michael Horn, exterior lighting designer at Audi. "We can communicate in complex situations that, without the lights, would absolutely require eye contact with the driver." Audi, a German car manufacturer owned by Volkswagen, is one of many companies developing electric cars and last year created an all-electric car based on a design used in the computer game Gran Turismo. At the Geneva International Motor Show last month, manufacturers inducing Seat, Aston Martin and Citroën showed their eco-friendly mobility options.